Many of us who have been in the field of the employment of people with disabilities have been working to tear down a wall of segregation. But there are those who are now trying to rebuild it brick by brick. 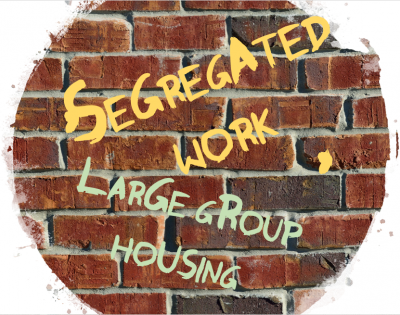 When I spoke at the APSE Employment First Conference a few weeks back, I spelled out some of the outlandish claims pro-segregation advocates were making – for instance, that current laws and policies are restricting choice because they limit segregated placements. I pointed out how well-organized these segregationists are. They include many national agencies who provide disability services. I believe some in attendance at APSE might of felt I was overstating the situation. After all, these same agencies like to use the words inclusion, employment first, and other tags that make them appear current and caring about integration. But, let’s look at what is happening. In December, 2017, The Department of Justice under AG Sessions withdrew its October 2016 guidance on the Integration Mandate of Title II of the Americans with Disabilities Act and Olmstead. The Olmstead decision, from 1999, ruled that states must place people with disabilities in the community if “community placement is appropriate, the transfer from institutional care to a less restrictive setting is not opposed by the affected individual, and the placement can be reasonably accommodated.” This has been applied to work settings as well, ending documented systemic and needless segregation in places. It is apparent now that Sessions’ Department of Justice is open to maintaining sheltered workshops. In other words, a sheltered worker, surrounded by others with disabilities, would still be considered “integrated” because he or she is interacting with staff, or potentially the worker loading a soda machine, and the person delivering mail. If you really believe that represents integration, it is tantamount to saying integration also occurs when a cafeteria worker says hello to a prison inmate. This proposed bill would also amend the Rehabilitation Act and change the integrated employment definition to include non-competitive jobs. This is setting up a false choice, where a real job is offered as being unsafe, being teased by unkind co-workers, and having little to do with self-worth, etc. If this is their understanding of community employment, they shouldn’t be providing vocational services, period. So, if you don’t think there is serious backsliding going on that directly threatens Employment First and continued deinstitutionalization, you are dreaming. The Disability Industrial Complex has always been resistant to change, but for those who fight for the civil rights of people with disabilities, there was support at least within the law, the courts, the research citing the ineffectiveness of segregated employment and large group housing, and our belief in the morality of ending segregation and sub-minimum wage. It is now looking like disability rights will be faced with ignored research and little government support. The future is at risk is so many ways. Call your representatives, start advocating, and get loud.